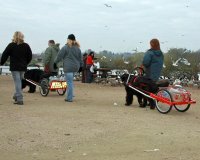 Carting can and must be fun for you and your dog. Building up your relationship as you learn to work together as a team can be very rewarding. If you make ‘work’ a pleasure for your dog he will give his best. Although pulling a cart should be confined to dogs who have reached at least 15 months, are fully developed and fit, there is no reason why basic obedience training cannot be started before. A working dog must be ‘steady’ at all times to avoid accidents and must be obedient while working. Basic obedience is the starting point, though there are certain differences from normal obedience which are useful to know. For example, it is useful to teach your dog to halt and remain standing, possibly a different command such as ‘whoa’ could be used. When taking your dog for a walk teach him direction commands he will need to know later, i.e. right and left, also commands such as ‘walk on’ and ‘whoa’. In carting it is necessary to work the dog from both sides and from in front and behind. This could usefully be practised using a long lead. Encourage the dog to walk ahead of you and when he is happy doing this, incorporate directional and other commands. Teach your dog to go backwards, find a narrow but longish confined space - between furniture, walls or an alley between buildings. Let the dog get used to the place then enter the area backwards with the dog facing you. When the dog is well into the area, give the ‘back’ command and reward one single step. Build this up gradually till the dog can back the full distance. Move next to a place with only one side to guide the dog and repeat the process of building up from one step. Eventually move to an open space but possibly use two poles or ropes to mark the area, again build up. Keep your hands low so the dog is not encouraged to look up which might cause him to sit. DO NOT lean over your dog in an attitude which might be seen as aggressive. It may take some time to teach this, but patience is rewarded! Teach your dog to stand quietly while being harnessed or unharnessed, allow him time to get used to the harness. Make sure you understand how a harness should fit and that your dog’s harness is adjusted correctly. Once harnessed your dog is ‘working’ and should not be allowed to do anything which would be dangerous if in a cart i.e. swimming or chasing another animal. Give the dog short walks wearing his harness to get used to it. Practice the control exercises 1, 2 & 3 with the harness on. Once a dog is approaching 15 months, is calm and happy to wear his harness and will respond to commands it is time to start with a cart. This process will require two people. It is preferable to do this on short grass which allows the cart to move easily and is not as noisy as tarmac or concrete. Start by letting the dog examine the cart then move it alongside him as he is walking. Next, one person should lead the dog and the second position the cart so that the shafts are on either side of the dog but not attached. 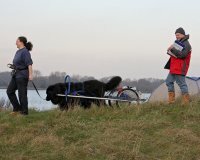 The final stage is to attach the traces to the dog’s harness and gradually let him take the weight of the cart. This process should be done gradually with lots of praise and with great care not to frighten the dog. Ensure that your dog is confident before moving on to the next stage and never overtire a young dog. Now your dog is confident and happy pulling a cart it is time to move on to building up distances and weights. As with advice already given, BUILD UP SLOWLY. 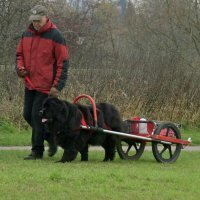 Check that your dog can walk four miles without problems before you start doing any distances with the cart. Before starting, always check your equipment – make sure the cart is in good repair and the harness fits properly. Always carry water and a bowl with you as this is considered a normal weight of the cart in tests. 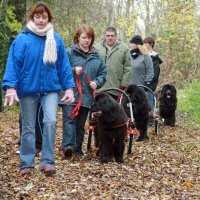 Have a rope or spare lead to attach to the cart so that you can help in the steep bits or if your dog gets tired – remember you are a team and the dog should not do all the work. If your dog looks tired or in any way distressed, stop the haul and take him out of the cart. Carefully secure anything you load in the cart. In a wagon (4 wheels) keep the weight roughly in the middle in a cart (2 wheels) the position is critical and should be over, or slightly forward of a line between the centre point of the wheels to balance the cart, forward would put the weight on the dog and backwards would cause the shafts to lift. Build up weight & distance slowly. The dog should be able to complete each section with ease before moving on to the next. Keep inclines/declines to a minimum to start with – reduce distances if severe inclines can’t be avoided or remove the weight and carry it yourself until you are back on level ground. etc.... going up to 4 miles and 20 kilos. When doing the longer distances, stop periodically (at least 4 times each hour) and check your dog. Let him relieve himself if necessary. Check pads, especially on rough terrain. Make sure the harness isn’t rubbing or caught on fur. Give water (in moderation – a full bladder is uncomfortable when pulling a cart). Check the cart, wheels and axles etc. Check that the load is secure and hasn’t moved. You can use these halts to work on down-stays. Your dog should already be able to do this on command (no hands) without a cart. As before, start with just one step and build up gradually then introduce some weight. He should stop and stay if commanded so that you can straighten the cart if it moves offline. Once your dog has a little experience, allow him to choose his own route wherever possible. He will soon learn to avoid ruts and potholes and traverse steep slopes rather than attacking them head-on. Only correct where you think he has got it wrong – but have confidence in his ability to make the best decision . Try to get into the habit of slowing down for downward slopes and he will soon learn to lean back in the harness to slow the cart down. He will probably find it easier to take upward slopes at a trot. Try hauling the laden cart yourself to get an idea of the effort required. Remember "you are a team", assist your dog. This page is offered as guidance to those starting out in draught work and is based on experience gained - it is not a complete training manual. Further advice can be obtained by contacting the Chair of the Working Sub-Committee of the Northern Newfoundland Club.